Even though the 4th is just one day, the fireworks last for several days. Sometimes a month or more. 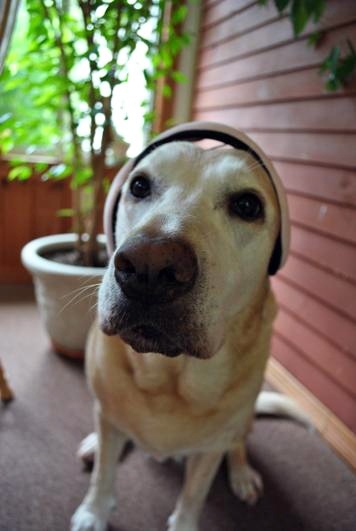 For those living with a dog afraid of loud noises, it’s a very long time. A dog afraid of loud noises can’t help it. It is an honest fear of sound. It may have roots in a particular incident or storm, or they may be born with it. Dogs with separation anxiety have a higher incidence of noise phobias. Noise phobias usually worsen over time, and other dogs in the household may ‘learn’ to be afraid of loud noises, too. When they see their buddy obviously worried about something, it is common to join in. By approaching noise phobia quickly and completely, you help the dog affected, companion dogs, and people, too. It is no fun being near a panting, drooling, trembling, hiding and pacing dog. Calming words usually don’t help, and your dog may pick up on your stress, making the situation worse. Here are some of my favorite tools to manage noise phobia. As always, if your dog has issues with noise, please talk to your veterinarian – there are very safe and effective medications to help with this condition. Create a safe space and accentuate normal activities – Dogs pick up on what we are feeling. Being annoyed, tense, or trying to soothe your dog may just make things worse. Put on some music or turn on the TV to create a sense of calm normal. I will use a treat or a play fetch with a toy to help distract. If Sophie responds as normal, then her stress levels are OK. There are many ‘white noise’ CDs and iTunes types of apps to play in the background, or you can make your own by turning on bathroom fans, stove fans, etc. something to dampen the noise of fireworks. Plan the potty breaks – I always let the dogs out ‘one more time’ before bed. If fireworks are happening, no way will Sophie do her business. I plan ahead by taking several walks in the day time, planning an earlier than usual meal, and doing the last outing just at sunset – before the main fireworks start. This means an early outing the next morning, but it has helped tremendously. Thundershirt – The Thundershirt is easy to use and surprisingly effective. I say surprisingly, because I had my doubts when I was sent one to try out on my dog for a review, but it works well for my dog. I took this photo last night (July 1st) as she slept through fireworks happening outside. You can order these online or find them at local retailers. You can also try to make your own wrap to help with anxiety. DAP Collar/Spray/Diffuser products – DAP, short for Dog Appeasing Pheromone, is our best friend. It is completely safe and non-toxic and works wonders for Sophie, creating a sense of calm and it works amazingly well with the other techniques above. Learn more about the DAP collar and DAP spray. These products can be purchased online or at local retailers. Call your veterinarian – As always, your veterinarian is your first stop to discuss behavior changes or problems. It is important to rule out any underlying medical problems. Your veterinarian can also prescribe medication such as anxiolytics to reduce the anxiety without making your pet ‘out of it.’ Learn more about treating noise phobias. Even though it is the holiday, call your veterinarian. If you do not have an emergency clinic in your area, your veterinarian should have recorded instructions about who to contact in the case of an emergency. Veterinary emergency clinics commonly deal with these issues. Each time your dog makes it through fireworks or a thunderstorm with a sense of calm/confidence, it helps slow the trend of getting worse each time (untreated). Sophie’s overall noise sensitivity has decreased, using products such as the Thundershirt and DAP. She will never love fireworks, but instead of hearing one and trembling and pacing for an hour, she lays down right away and sleeps like usual or eagerly accepts a treat. I can live with that. I don’t want my two Greyhounds to ‘learn’ to be afraid, and they are loving the unsolicited treats! I will only treat naturally. For firework fear, phosphorous and Rescue Remedy works well. thundershirt helps a little bit. and we just sit together and wait it out. Although nothing cures completely, Thundershirt helps lower the stress level some.I don’t leave my boo alone when I know there will be fireworks, put the shirt on and play with a fun toy, or if he chooses to stay in his crate, just be there with him. I bought the Thundershirt and although it’s not perfect it is helping George quite a bit. He’s my Parti Pom in the main picture. I also bought a calming collar for him. I am going to check out “exposure therapy” for him this year hopefully before New Years. I don’t want to medicate him if I can avoid it. I raised my dog around a lot of people and a variety of noises. As long as I am calm and collect around him, he feeds off of that and is calm despite all the booms. He gets a tiny bit shaky around the huge mortars, but who doesn’t? I keep benadryl on hand just in case, but I’ve rarely had to use it. He’s a 4 yr old boxer. The only thing that has worked with my thunderphobic dog is she got older (18 now) and lost her hearing. We make her a comfortable hiding place between the big lazy boy chair and the wall. I have rescued several panicked dogs during fireworks so we always stay home and keep a close eye on ours. I also lock all the cats in the house. We hate fireworks ! The thundershirt works really well for us. Also, during a storm or fireworks, we just turn up the television and keep everyone inside. Sorry I clicked enter before done. Cecille, it doesn’t always work on furs. 🙁 Sorry it’s not helping yours. I just got the Thundershirt to try last week. So far it seems to help Duffy and with her less stressed the other dogs aren’t reacting at all. Tonight will be the big test but I am glad I bought it. In the past, I used drugs from the vet (generic Xanax) for one of my dogs who was so utterly terrified of the noise, we were afraid he would injure himself. For the most part, I find that if I’m calm, myself, the dog also remains calm. I have a cocker spanial and he is scared to death of fireworks and thunderstorms……even a snap and pop scares him….as long as we don’t lose power during a storm I usually stay on the computer and he stays under my desk….its a big wooden desk so he’s close but as for anything for meds I tried some once when he was a pup and it put him out so stone cold that I was scared for him and haven’t tried anything else since…..plus here in Georgia we have been getting a lot of quick storms that we don’t have enough warning for lately so its too late. Benedryl works wonders just sadates them a little 1/2 for the little dog , 1 for medium dogs , 2 for large breeds of dogs you can adjust the dose if need to, been using it or years ! Our male is scared of thunder and the distant popping of fireworks with good reason, as he had been abandoned in a very small make-shift, uncovered pen, where he was exposed to all manner of Mother Nature’s elements. We haven’t been able to desensitize him to loud noises, so we always turn on the tv or radio and sit with him when he’s frightened. He trusts us to take care of him and we always will. wolves in the wild must fear noise that could be the result of an approaching predator, fire, etc… and dogs are from wolves by origin, so this phobia is evolution based, like most phobias, even human ones.